After over a year of waiting it is finally here! The new Game of Thrones season kicked off this past Sunday with a universally acclaimed season opener that was the longest first episode of any of the shows seven seasons, topping out at over an hour. It had a record-breaking 10.1 million people watching (there was at least one other GoT party going on just on our floor in the apartment building I was watching at), but last season topped out an average of nearly 8 million an episode (not even including the extra 2 million who DVR or streamed it later in the week), a massive climb from season one’s 2.5 million. So, let’s jump right into this poignant opener to the penultimate season of what might television’s greatest show ever. Speaking of the North, we kick things off there at the Wall where Dolorous Edd encounters Bran Stark and Meera Reed who have finally trekked down from the Three Eyed Raven’s cave. After some debate about their identities, Edd lets them in when Bran insists it’s vital to stopping the White Walkers. Farther south in Winterfell, there are even more debates to be had. Jon Snow is holding court in the great hall where they argue over how to deal with the remaining Karstark and Umber family members after they fought for the Boltons at the Battle of the Bastards. Jon believes that children should not be punished for their father’s crimes, however, Sansa insists that their respect strongholds, Karhold and Last Hearth, be given to families who were loyal to Jon when he called for aid. They get into a heated argument that ends with Alys Karstark and Ned Umber both swearing allegiance to House Stark and retaining their ancestral home. After the meeting, Jon warns Sansa not to undermine him in front of their subjects. She insists, however, that he needs to listen to her council, considering the time she spent at court with the Lannisters and the knowledge she gained watching Cersei. However, Jon is unnerved at her tone of admiration for Cersei and her power. They receive a raven from Cersei, telling them to swear allegiance to her or be marked as traitors. Later, Little Finger attempts once again to woo Sansa, who cooly rejects his advances. After Arya’s work at the Twins is complete, she rides south for King’s Landing where she comes across a group of Lannister soldiers. They offer her food and a place at their fire, talking about their families that await them when they return home. She tells them that she’s heading to the capital to kill the queen, to which they laugh, believing her to be joking. Meanwhile, the Brotherhood Without Banners and the Hound are headed north. They decide to take shelter in a farmhouse that Clegane had robbed from years earlier while traveling with Arya. They find the family inside had committed suicide rather than face starvation and winter. Thoros of Myr then makes the Hound watch the flames of the fireplace for visions where he sees the army of White Walkers marching past Eastwatch. Later that night, he gives the family a proper burial. Cersei and Jaime are plotting how best to handle their situation of no allies and low supplies. Jaime wants to discuss the loss of their final child but Cersei insists he was weak and that’s all there was to it. Cersei has called on Euron Greyjoy and the Iron Fleet. He offers her a marriage proposal as well, which she rejects. Insistent, Euron promises to bring her a gift as a token of his good faith. Sam has begun his training as a novice maester-to-be which includes the grunt work of cleaning chamber pots, serving food, and acting as a personal servant for the Archmaester. Despite the other novices and maesters not sharing Sam’s interest (or even belief) in the threat of the White Walkers, he steals a book from the restricted section (Gasp! Without an invisibility cloak!) and learns that Dragonstone has a massive deposit of dragonglass, the only weapon known to kill White Walkers, beneath it. He sends a raven to get word to Jon. While collecting dishes from the quarantined patients in the Citadel, he comes in contact with Jorah Mormont who asks if Daenerys has arrived yet. To which Sam says he hasn’t heard anything. 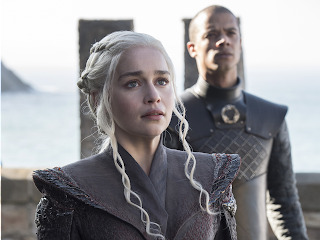 As with many Game of Thrones openers, this one was more set-up than anything else: a healthy mix of where-are-they-now and the next steps toward the season arcs. This did have some nice moments in the form of Arya offing the rest of the Freys, and Dany finally standing on Westeros shores. It will likely pick up speed quickly with the show's compressed episode count, though the episodes themselves are longer than normal running times across the board. Starting with Bran crossing the Wall... not a smart move. Bran was marked by the Night’s King, which allowed the King and his army to infiltrate the Three Eyed Raven’s cave, despite the protective wards. Considering the Wall utilizes similar magic, Bran crossing the Wall will likely allow the Night’s King to march past the magic and into the land below. But Bran, being Bran, ignored that little incident (that got Hodor killed) and came back anyway. At Winterfell, Sansa and Jon’s relationship got a few more dents in it after their sibling spat in front of their bannermen. Though it doesn’t seem like Sansa has any plans to take Jon’s throne for herself, she admits he’s a good ruler, despite their difference of opinions. However, if she thinks he’s making the wrong choice for their family, I don’t doubt she’ll make an attempt to stop him in whatever way possible. She compares Jon’s lawful good mentality to their father and notes that it is a flaw that got their father killed. Another interesting point here is the way Sansa seems to be seeing the benefit in emulating Cersei. That was unnerving for all of us but not unexpected with what Sansa endured and the decisions she’s made since then. Speaking of Cersei, she’s currently on my dead pool list I have with my friends because I’m fairly certain she’s not long for this world. The prophecy that once told her her children would not outlive her also told her she would become queen until another queen came to unseat here. While Cersei dismisses Dany’s armies as an unorganized mess of Dothraki riders, slave soldiers, and Westerosi troops, it’ll be interesting to see if she recalls that prophecy and the possibility that it didn’t refer to Margaery as she once assumed. And the last part of that prophecy, that her younger brother would kill her, seems a lot closer than ever with Jaime’s dwindling trust in Cersei’s decisions (and her actions in the previous season finale). Dany and Jon are destined to meet, and not just because set photos prove they have multiple scenes together later in the season. But Dany is, unknowingly, sitting on gold mine of something that is going to become more precious than gold. And while her TV counterpart has no apparent knowledge of the White Walkers, in the books she has several dreams of fighting ice covered warriors on dragonback. Whether or not she takes the Iron Throne first, she’ll be called north. Her dynamics with characters there, especially those who worship the fire god, should be interesting. It’s too early for me to throw out in-depth theories so we’ll just leave it at that. There was lots of good stuff in there - Arya showing just how much she’s learned (and being eerily calm about killing so many people in one go); Cersei’s madness acquiring more and more of the touch of Berlin 1945 about it - “I’m the Queen of the Seven Kingdoms!” she yells, “I think we’re down to about three or four now, actually” Jaime replies dryly - and is it my imagination, or is Jaime getting calmer and more mature even as Cersei spirals? ; Daenerys finally landing; the army of the dead looking eerily daunting. But Jon and Sansa - oh dear. They both had half a point - Jon is right that the King’s family and advisor should not argue with him in front of his subjects, and Sansa is right that they should be rewarding loyalty, so why did they both ignore the obvious solution? With Ramsay’s death there are no Boltons left, so reward the loyalists with the lands around the Dreadfort and and allow the children of traitors to prove their loyalty by acting as speed bumps in the road of the army of the dead. It was probably my only real eye roller of a moment when they were both forced to act stupid in order to manufacture an unnecessary conflict. Pop singer Ed Sheeran cameo’d as one of the Lannister soldiers Arya ran into. Apparently Maisie Williams is a big fan of his and this was pretty much set up as a treat for her, so that was nice. Not enough Tyrion:-( We need more Tyrion. Let’s hope Dany kills Euron quickly (she’s got to be the prize he was talking about to win Cersei’s hand).